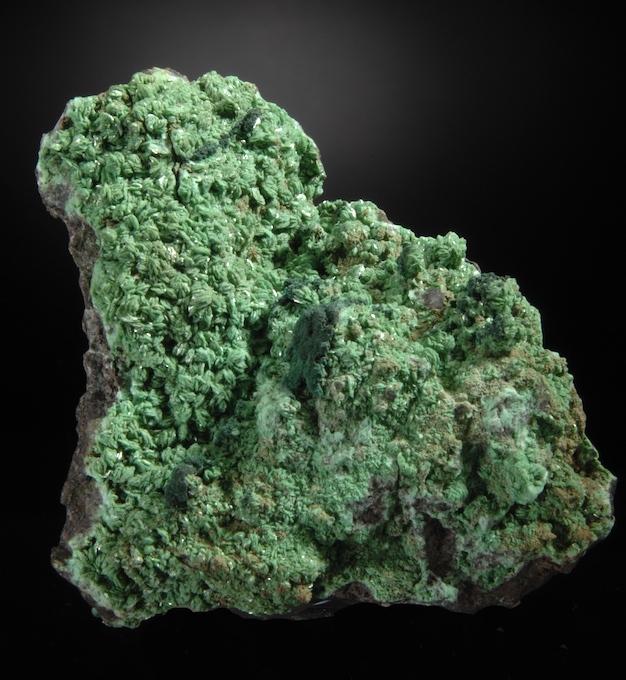 A significant and exceptionally fine cabinet specimen of well crystallized Olivenite-Zn from Tsumeb. 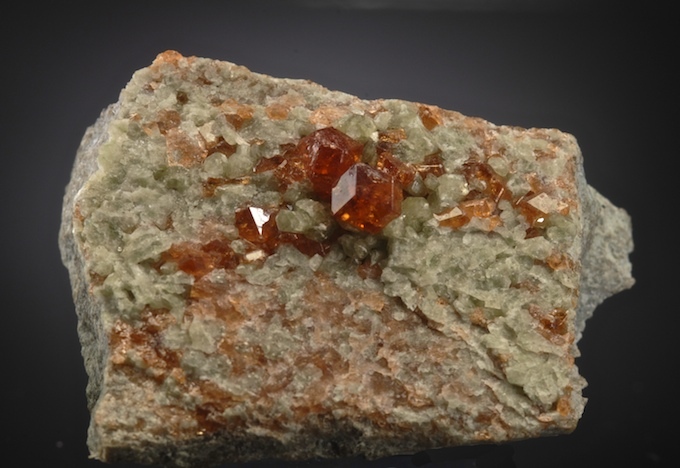 The surface is densely covered with tabular hexagonal crystals which is a rare Olivenite habit typical of zinc rich varieties which is chemically very close to Cuprian Adamite. The crystals are clustered in rows, stacks, sheaves and rosettes. The condition is excellent and by naked eye perfect, 20X magnification finds just a few very tiny rub spots. The matrix is massive Cuprite and the esthetics, color and display quality are all top notch. This is an exceptional and important Tsumeb specimen that will be a fine addition for a top quality suite. Neptunite crystals with very high luster reaching 2.3 CM are set on contrasting snow white Natrolite. 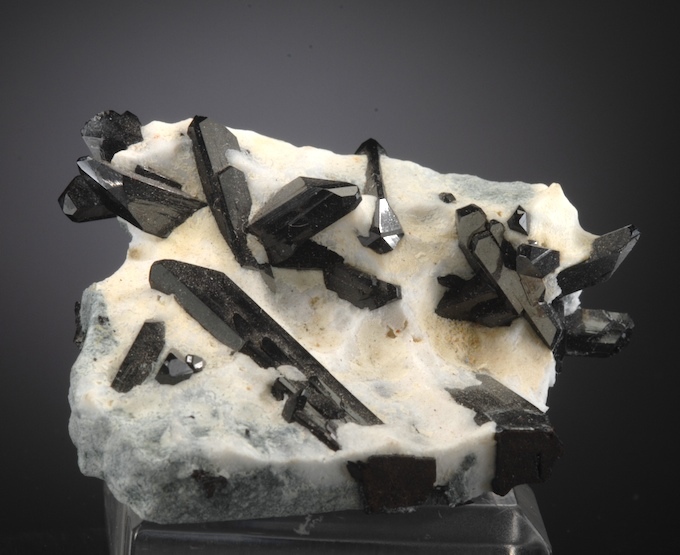 A very attractive specimen in good condition with textbook terminated crystals some of which show doubly terminated prisms well exposed from the matrix. There will not be any more of these as the locale is finished, this is an older recycled collection specimen. Another Brazillian classic. 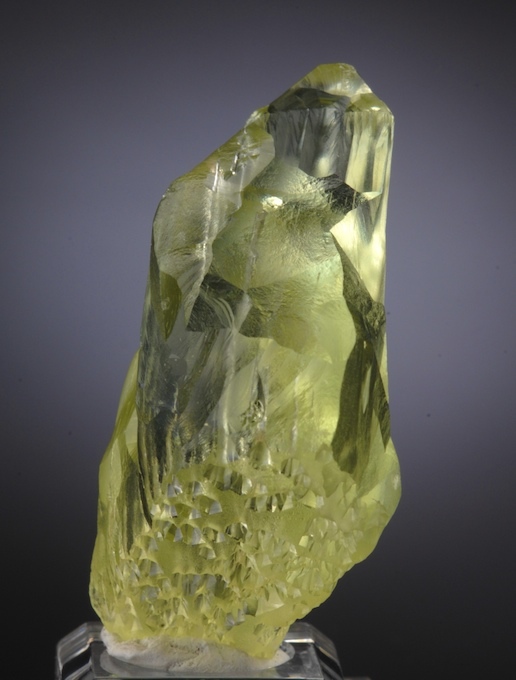 This features a fine sharp, glassy and partly gemmy Brazilianite that is nicely paired with Muscovite showing twin crystal forms. In great condition, the specimen displays very well from several sides. From the major pockets found in 2008, this quality is not being found now. There have been two major finds of fine Brazilianite in the past 70 years, both were different in habit, it may be a long while before the next one if ever. A good value for an esthetic and choice specimen. A small but choice single cube with a tiny bit of matrix from this very interesting location. 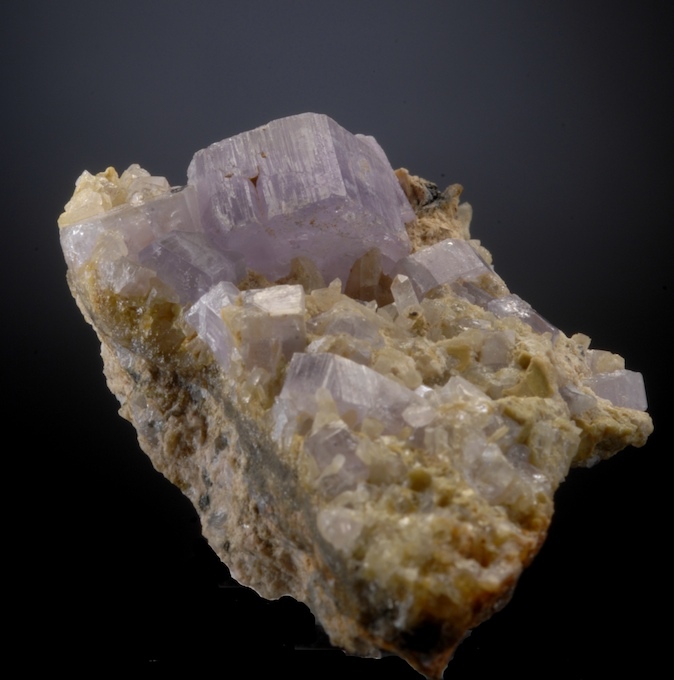 Excellent clarity (better in person) and sharply beveled corners are features of these Fluorites. This is in fine condition damage wise, small contacts are noted on the backside. 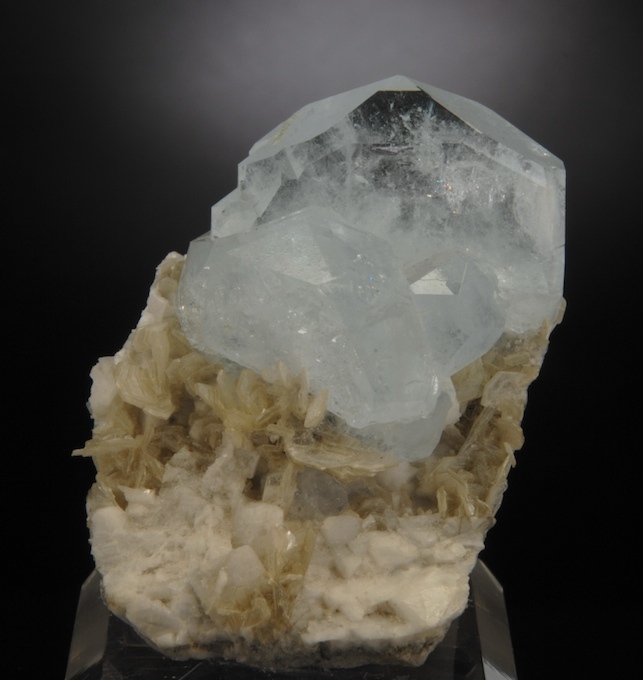 Tabular style Aquamarine specimen from Xuebaoding is a modern classic. This one has excellent form and very good color, transparency and glassy luster. In fine condition this has very esthetic display impact. 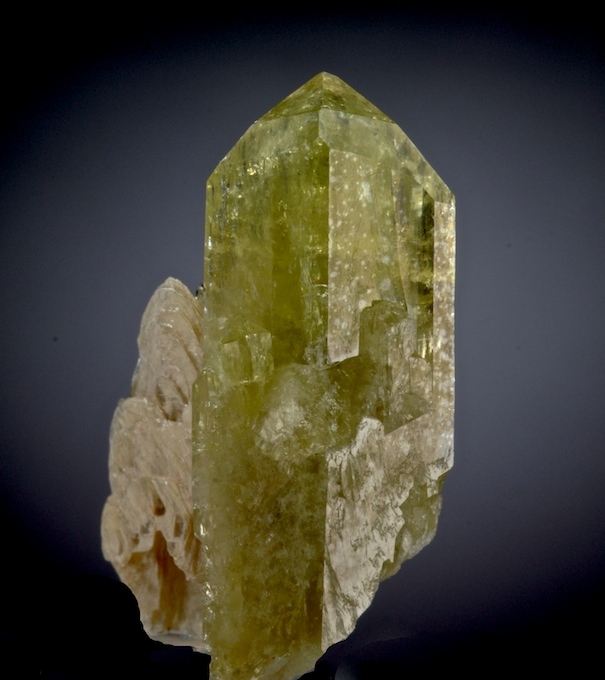 The main crystal is 3.9 CM across. An old German classic Apatite with sizable purple crystals on contrasting matrix. 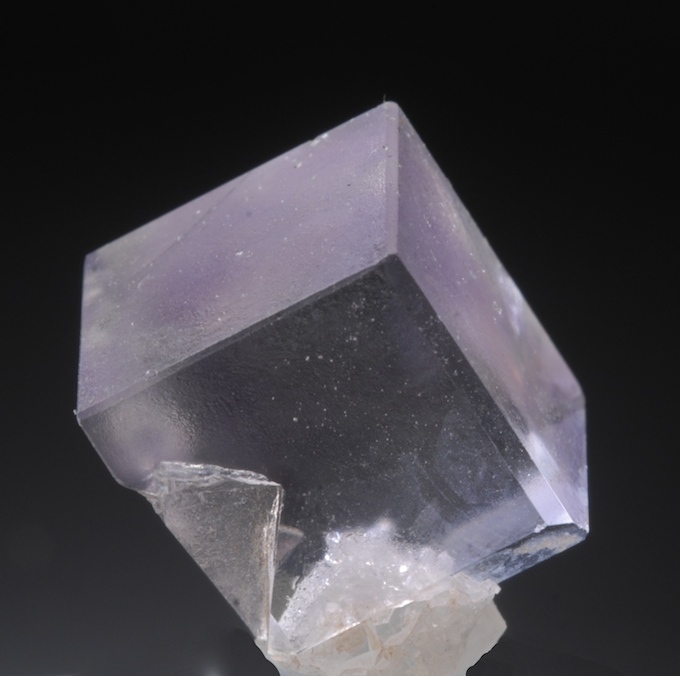 Crystals are up to 1.6 CM in size with large transparent sections and sharp form. There is an old repair on this piece that is only seen with good magnification. The crystals are overall in good condition but there are some tiny broken quartz and chipped Apatite that is best seen at 10X magnification. This is in very good condition for its age, and the crystal size is huge for the locale. Esthetic. Ex Jorg Walther collection. A perfect complete etched floater Heliodore crystal from the famed (and now gone) Volodarsk deposit. This locale produced these remarkable Beryls in "chamber" pockets which are now highly prized. The complex sculpture of this specimen is impressive and esthetic. 100 percent gem grade, this is all facet grade with no internal flaws or veils, has great color and is a hefty 27.8 grams. In perfect condition with no chips, this can be displayed from any angle with impact far greater than its size.